The LA Times reported today that d-Con rat traps has agreed to discontinue a line of traps containing poison that has made its way into young children, wildlife, and pets. "This is a significant victory for environmental protection and corporate responsibility," Jonathan Evans of the Center for Biological Diversity in San Francisco told the LA Times. "While the fight isn't over until all of these hazardous products are off the market, this decision keeps the worst of the worst products from residential consumers." 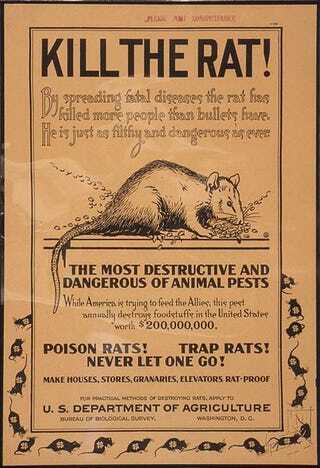 The manufacturer of the d-Con trap said that while licensed professionals would still be able to purchase the use the current line of traps, the new consumer models, which will be available next year, will contain effective rat poisons for which antidotes are readily available, and will not contain neurotoxins. While it's only a partial victory, it's good to know that the unintended victims of rat poison will fare a bit better, at least in California. Header image: public domain (source).